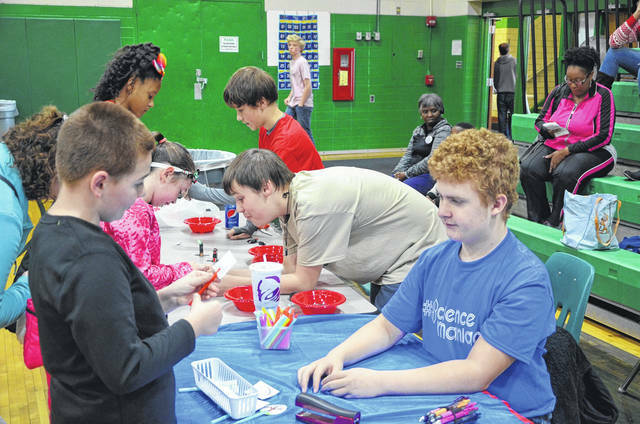 At Science Mania 2017, Northmont Science Olympiad team member Connor Carmody (blue shirt) works with students on an optics activity; while brothers Parker and Payton Anderson guide students through a circuit experiment. CLAYTON — On Saturday, December 1 from 1:30 – 4 p.m., Northmont Middle School will be hosting the annual ‘Science Mania Day!’ This is a Science Fun Day, targeted for any students in grades 2 – 6. The Northmont Middle School Science Olympiad team will be participating in a day long Build-Event exhibition, including Battery Buggies, Boomilevers, Elastic Launched Gliders, and Roller Coasters. All of these exhibitions will be open for viewing by the general public. At the same time, Science Olympiad team members will be running over 35 hands-on science booths, with experiments and activities targeted for elementary age students. These activities will cover all areas of science, including Anatomy, Chemistry, Circuits, Coding, Density, Engineering, Forensics, Fossils, Genetics, Geography, Glaciers, Herpetology, Meteorology, Solar Systems and Thermodynamics. This is a fundraiser for the Science Olympiad team, and admission is $2 per person at the door. There will also be concessions foods and baked goods offered for sale inside; along with a Raffle table full of holiday gift options donated from local businesses. Any and all elementary students and their parents are invited to come join us – do some fun activities, watch some really neat events, and get excited about science! The Northmont Middle School Science Olympiad Team, and the Science Mania Event, are generously supported by donations from the following area businesses: Applied Mechanical Systems, Arby’s, Buffalo Wild Wings, Cassano’s, Cheryl Bruce Massage Therapist, Code Credit Union, Company 7 BBQ, Dayton Dragons, Do it Best Hardware, Englewood Fun Center, Firehouse Subs, First Financial Bank, Gaming Adventures, Hot Head Burrito, JD Custards, Jessy White, LaRosa’s Pizzeria, Marilyn Jewelers, New & Olde Pages, Jessica Posh at Perfectly Posh, Pizza Hut, Precision Tune, Ray’s Wine and Spirits, Subway, The Primitive Shoppe, Tim Horton’s, United Dairy Farmers, US Bank, and VanCon Construction.